Along with the ongoing vacuuming project, a moth treatment has been scheduled for this Saturday, March 30, beginning at 9:00 p.m. In addition to moving any boxes or other materials away from the floor, if you have food items stored in your workspace, you should remove them prior to the treatment. If you are unable to do this, you may consider discarding these items when you return. Regular access for Extended Readers will resume when the library reopens on Sunday, March 31. As vacuuming will continue on Sunday night, please continue to keep all items off the floor. Four new specialized Getty Library Research Grant opportunities have been generously funded by a Getty Research Institute Council member. Please share with your colleagues and students as appropriate. Note that two of the grants are specifically designed to encourage research in primary sources by undergraduate and early career graduate students. — Research project focusing on an aspect of the art critic Clement Greenberg’s work utilizing the Clement Greenberg papers. — Research involving the library’s special collections that focus on published and unpublished resources about the scientific aspects of materials used in the production of art, such as paper, pigments, textiles, and plastics. — Research opportunity specifically for an advanced undergraduate majoring in art history, architectural history, or studio art, to conduct research in the library’s GRI’s special collections and library. — Research opportunity specifically for a graduate student in the early stages of a graduate program (pre-M.A. or equivalent) in art history, architectural history, or studio art to conduct research in the GRI’s special collections and library. Applications are now being accepted and are available online. The deadline is April 30, 2019 for grants to be used between July 8, 2019 and December 20, 2019. The Getty Research Institute (GRI) is pleased to host a book release with a program featuring the author, Thomas S. Hines, along with LACMA senior curator Stephanie Barron, GRI senior curator Maristella Casciato, UC Irvine professor Ed Dimendberg, and architectural historian and Carleton University associate professor Inderbir Riar. 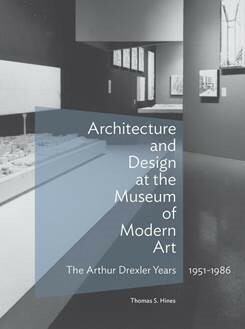 Drawing on new archival research, Architecture and Design at the Museum of Modern Art analyzes how MoMA became a touchstone and catalyst for the practice and study of midcentury architecture. Thomas S. Hines is a professor emeritus of history and architecture at the University of California, Los Angeles, where for many years he taught cultural, urban, and architectural history. The program is followed by a book signing with the author. Join a Reference Librarian for a 30-minute overview of the Library Catalog new interface. Learn the basics and ask questions too! When: Mondays at 3:00 p.m. or Thursdays at 11:00 a.m. Sessions start on March 14 and will take place through the end of April. What: Topics covered include searching, saving records and searches, requesting material, and overview of the “my account” feature. Seating is first come first serve. Reservations are not required. We are writing to re-introduce you to Primo Search, now rebranded simply as the Library Catalog, describing the more straightforward and comprehensive search experience that launches on Tuesday, March 12. This upgrade allows us to take full advantage of new features and system updates as they are developed. Do I access the system the same way? You will access the Library Catalog the same way you have accessed Primo Search with one change: passwords now need to be at least 8 characters so you may be prompted to change it the first time you sign in to the system on or after March 12. Are there changes to how the search works? 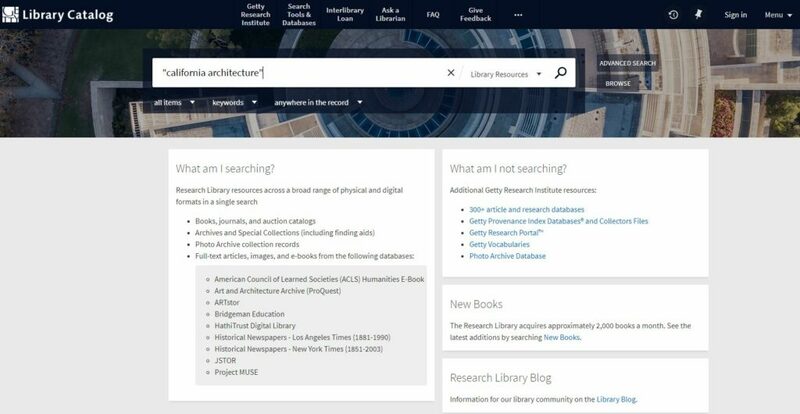 Yes, the default search is now called “Library Resources,” which includes our physical and digital collections as well as resources from a selection of our specialized database subscriptions. This allows for the discovery of published materials, archival materials, digital collections, online articles, and more using a single search. Can I restrict my searches to GRI collections only? Yes! You can use the Collections facets to refine searches to include GRI Collections only. The facets appear to the left of the search results. What new features are included? A few highlights include Ask a Librarian, new books, citation options, internationalization of the interface, and more. Ask a Librarian: This link connects you to a request form where you can ask a librarian for assistance. New Books: We have added an easy way to browse and search new books directly from the home page. Citation options: For each search result, you can click the Citation button in the Actions menu to format a citation. Citations can be in the MLA (7th edition), MLA (8th edition), APA (6th edition), Chicago/Turabian (16th edition), or Harvard 1 formats. Internationalization: There are now many language options, including Spanish, German, Japanese, Korean and Russian, available for the translation of some of the interface. This provides additional assistance with navigating for non-English speakers; it does not translate all records or customizations in the system. We will continue to add new features and enhancements to the interface over time. 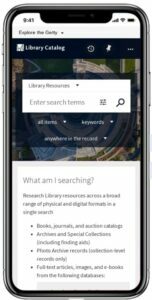 Can I search the Library Catalog on my mobile device? Yes! It’s now even easier. The Library Catalog is natively responsive, meaning it will resize and adapt based on the size of your device. How can I receive in-person assistance with the Library Catalog? – Attend a 30-minute introductory session held in the GRI L2 Training Room, Mondays at 3:00 PM or Thursdays at 11:00 AM, starting March 14 through the end of April. Reservations are not required. – Stop by the Reference Desk, Monday – Friday, 9:30 AM – 5:00 PM. – We also encourage you to book a one-on-one appointment with a Reference Librarian by contacting reference@getty.edu. – Finally, you are welcome to call the Reference Desk at 310-440-7390. How can I send feedback about the new interface? Please complete our Feedback Form with any comments or questions. Your comments will help us improve the interface and alert us to system issues that need to be resolved. Additionally, many other staff members from across the GRI and GDi have contributed to making this new interface possible. Thank you all. We look forward to tomorrow’s launch and welcome your comments and questions.